Babies are not just little adults. This simple observation explains why the Beech-Nut Company, a manufacturer of baby foods, voluntarily chose to conduct safety tests of pesticide residues in its products. According to a company representative, its tests considered "prenatal, environmental, physiological, and structural [factors]-which may cause a baby to react to food residues in a manner different from the adult." As a reason for Beech-Nut's tests, the representative pointed to the pesticide DDT and evidence that its "estrogen-like" qualities negatively affected sexual development in young animals. Given the vulnerabilities of babies, the company established a near-zero tolerance for DDT in its products. These statements sound contemporary, but they were made more than fifty years ago at a congressional hearing on the risks of industrial chemicals in the food supply. The company bore the costs of and responsibilities for testing; in the early 1950s, the federal government required no premarket safety testing for the hundreds of new chemicals transforming food production in America of the sort that was required for new drugs. Beech-Nut and other U.S. private food producers were essentially managing the potential risks of human exposure to hundreds of new industrial chemicals without any roadmap or rules. This came at a high price, at least for Beech-Nut, which spent thousands of dollars developing and conducting tests. The company was in a bind. On the one hand, consumers were demanding greater assurance of the safety of baby food, while on the other hand, the company's competitors found Beech-Nut's actions "hysterical." And so in the early 1950s, a Beech-Nut representative came before members of Congress to ask that the government fix this problem by setting tolerance limits or safety standards for all pesticides. By the early 1950s, innovations from the Second World War, such as DDT and new plastic products such as Saran Wrap, were rapidly entering commercial markets. The speed and scope of commercial use of pesticides and plastics, specifically those derived from an abundant and cheap supply of petroleum, brought tremendous change to the American economy and environment. The petrochemical industry-the integration of the petroleum and chemical industry-had become the critical building block of a booming consumer economy. It promised abundance, ease, and prosperity, but it also introduced unprecedented hazards into the environment and into the human body. A decade before Rachel Carson's Silent Spring (1962) popularized the dangers of pesticides, a small but vocal collection of consumers, scientists, and sympathetic politicians raised serious concerns about the long-term health impacts of pesticides, plastics, dyes, and many other classes of petrochemicals (derivatives of oil created when making gasoline) increasingly making their way into the American food supply. Over the course of the 1950s, Congress debated the need and, by the end of the decade, the scope of reforms to the 1938 Federal Food, Drug and Cosmetics Act to address new chemical hazards. The questions that emerged in these legislative debates considered how the state would manage and mitigate the seemingly inevitable risks of the new petrochemical age. What defined a chemical's safety if use and exposure were integral aspects of an advanced technological society? Answering this question shaped the political and scientific contours of debates in chemical policy for the next half century. The 1950s marked the beginning of an unprecedented economic boom in the United States. The stable provision of cheap oil provided the foundation for this economic and material transformation. Securing a cheap and reliable oil supply required several elements: exploration of and investment in domestic reserves, government pricing controls-supported by administrations from Theodore Roosevelt to Jimmy Carter-and development of stable relations with oil-producing countries. In The Prize, a history of oil, Daniel Yergin argues that by the 1950s a new "petroleum world order" had emerged that secured a steady supply of cheap oil to the burgeoning American consumer economy. As world oil prices fell, domestic consumption grew rapidly-from 5.8 million barrels per day in 1949 to 16.4 million per day in 1972. With the end of gasoline rationing in 1945, American drivers hit the road. Americans owned twenty-six million cars by the end of the war, and only five years later that number had nearly doubled. As the cold war heated up, the federal government continued to expand military contracts that had driven production during the war, thereby allowing the military to maintain its position as a major purchaser of U.S. goods and services. The expansion of the defense industry created new jobs, and government policies kept inflation and prices low, in particular the price of gasoline. In 1956, Eisenhower signed the Federal Highway Act, which allocated millions of dollars to the expansion of the interstate highway system. Cheap and available gasoline, cars, and highways spurred the development of suburban communities, many of which were financially supported by the government through the Veterans Administration (U.S. Department of Veterans Affairs) and the Federal Housing Administration's loans and tax incentives, developed to meet housing needs for returning soldiers and their families. In the 1950s and 1960s, the petrochemical industry experienced a growth rate "two and a half times that of the gross national product." Although some petrochemicals were produced from coal and petroleum during the interwar period, it was the investments and expansion of the major U.S. petroleum companies in the 1940s and 1950s that transformed the industry. As Peter Spitz remarks in a business history of petrochemicals, "Regardless of the fact that Europe's chemical industry was for a long time more advanced than that in the United States, the future of organic chemicals was going to be related to petroleum, not coal, as soon as companies such as Union Carbide, Standard Oil (New Jersey), Shell, and Dow turned their attention to the production of petrochemicals." The vast supply of petroleum generated a cheap and ready source of petrochemicals. Chemical companies and oil producers began investing in value-added products made from petrochemicals, such as plastics, pharmaceuticals, and pesticides, and started to generate markets for these new products. In this way, supply drove demand and created new markets for goods. For example, large-scale direct foreign investments in agriculture in the 1960s created much-needed markets for Jersey Standard's pesticides. Consumer markets for plastics and pesticides emerged almost overnight. The new suburban garage or kitchen was a veritable chemistry lab, full of new plastic surfaces, new poisons, and new cleaning products. Most notorious, of course, was DDT, used during the Second World War for mosquito control in the Pacific and Mediterranean regions to protect American soldiers against typhus, malaria, and yellow fever. After the war, the pesticide became commercially available to local governments, communities, residents, and farmers, who liberally sprayed DDT in residential neighborhoods and households to control for mosquitoes and other "pests." Many other pesticides, such as endrin, aldrin, and lindane, developed for war efforts, were rapidly introduced into large-scale agricultural production with the promise of raising crops yields and lowering food prices. New plastics appeared on store shelves: the oven bag, a plastic bag that could be used to cook food at high temperatures; Saran Wrap, developed by Dow Chemical Company, as well as Reynold's polyethylene plastic films, created during the war and used commercially to encase precut meats and hold lunches for the on-the-go modern worker; plastic baby bottles for those long car trips; and Teflon pans that simplified cooking and cleaning. Plastic resins developed during the war to replace scarce tin as a preservative lining in cans (tinless cans) came into widespread use in the packaging of motor oil and food by the 1950s. We are all just a little bit plastic. Traces of bisphenol A or BPA, a chemical used in plastics production, are widely detected in our bodies and environment. Is this chemical, and its presence in the human body, safe? What is meant by safety? Who defines it, and according to what information? Is It Safe? narrates how the meaning of the safety of industrial chemicals has been historically produced by breakthroughs in environmental health research, which in turn trigger contests among trade associations, lawyers, politicians, and citizen activists to set new regulatory standards. 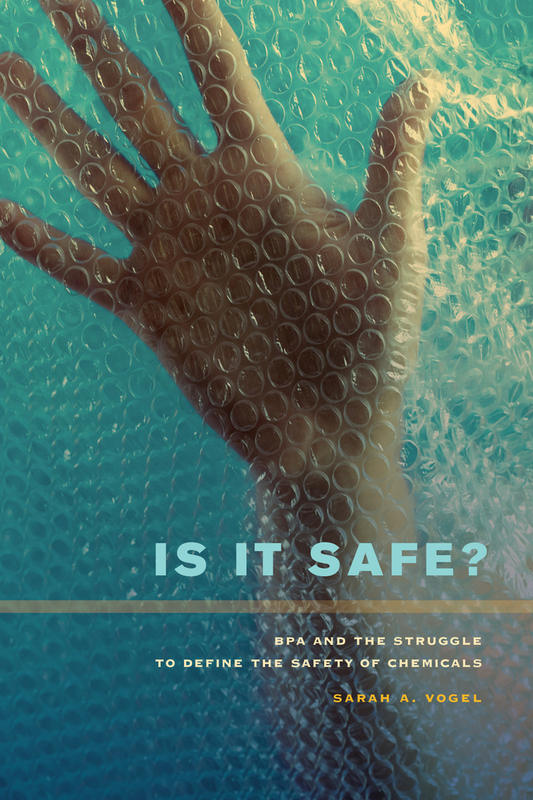 Drawing on archival research and extensive interviews, author Sarah Vogel explores the roots of the contemporary debate over the safety of BPA, and the concerns presented by its estrogen-like effects even at low doses. Ultimately, she contends that science alone cannot resolve the political and economic conflicts at play in the definition of safety. To strike a sustainable balance between the interests of commerce and public health requires recognition that powerful interests will always try to shape the criteria for defining safety, and that the agenda for environmental health research should be protected from capture by any single interest group.